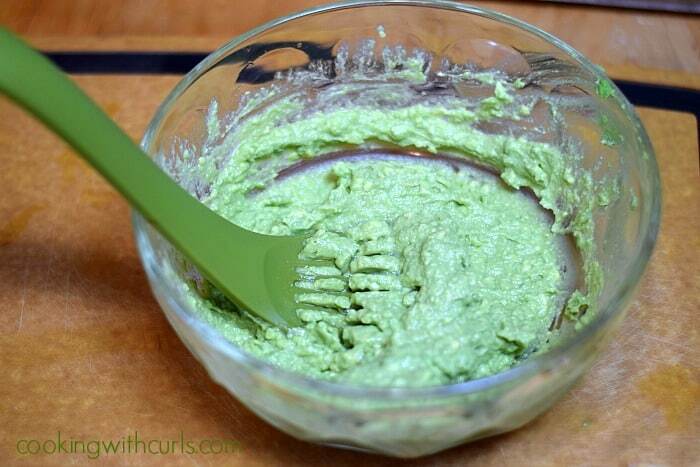 Do you like Guacamole? I do!! I love putting it on sandwiches and burgers, more than I like eating it with tortilla chips. Can you guess what I have coming up this week? That’s right, a few different uses for this delicious condiment. Now my version is a bit different, in that it does not contain chopped yellow or red onions. Say what? I am not a huge fan of raw onions, so I don’t use them very often. 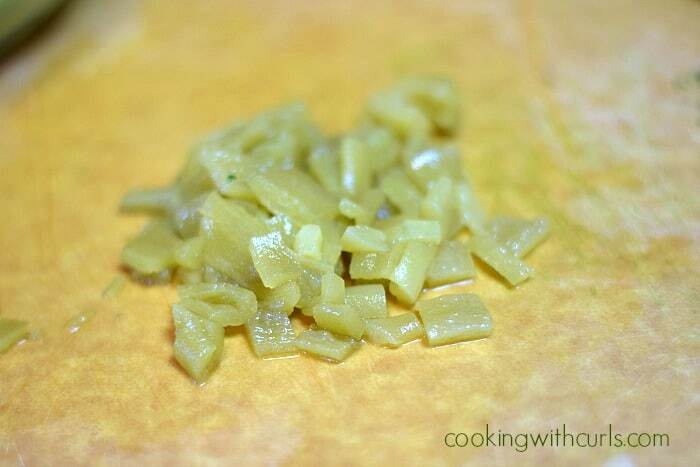 I have used green onions instead, and it is just as delicious…..I promise. 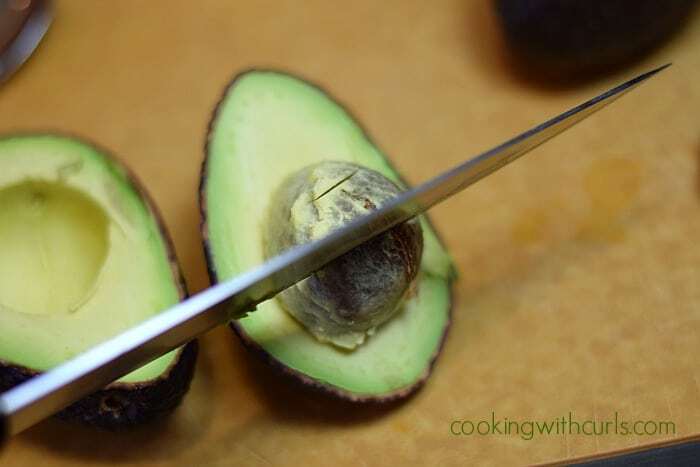 🙂 So do you know how to cut up an avocado? Well just in case you don’t, I will show you how I do it. 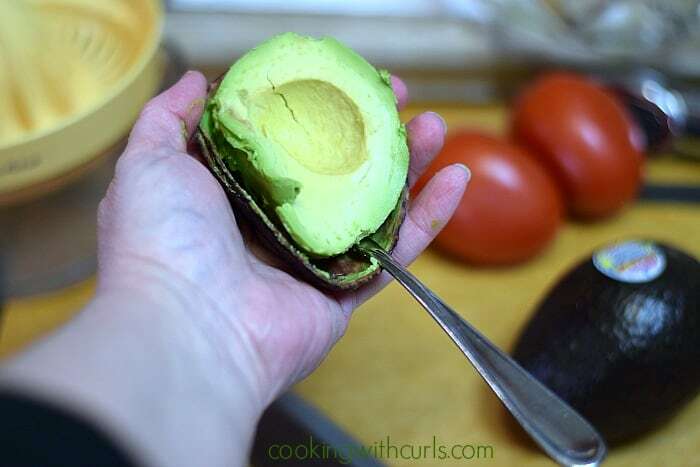 Start by cutting the avocado in half with a sharp knife…..
Now take the knife, and very carefully whack the pit with it…..
Now pick up the avocado half and twist the knife with the opposite hand to release it…..
Voila, now whack it against the trash can to get rid of it. Or, rinse it off, stick toothpicks on all four sides and place it in a jar of water so you can grow your own. 😉 Okay, now grab a large spoon, and run it around the outer edge….. If you were going to use strips for sandwiches, make lengthwise slices with a knife before you scoop it out of the skin. 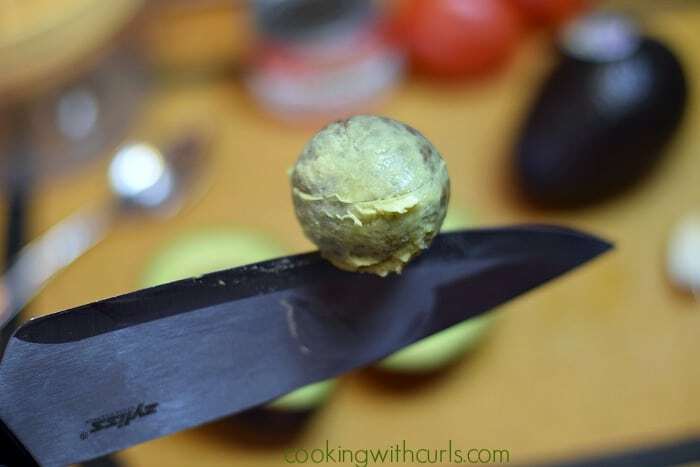 Toss the avocado into a bowl, and mash it with a fork or avocado masher….. I already told you that I own every kitchen gadget I can get my hands on! 😉 Now add the pressed garlic…..
and stir in the lime juice, cilantro, green onions, chilies, and tomato….. I just roughly chopped the chilies. Make them as big or small as you like….. If you like more heat, add minced jalapeno or serrano chilies. Season to taste with salt and pepper. Pour into a serving bowl and serve with chips…..
Store in the refrigerator in a sealed container for a week, if it lasts that long! 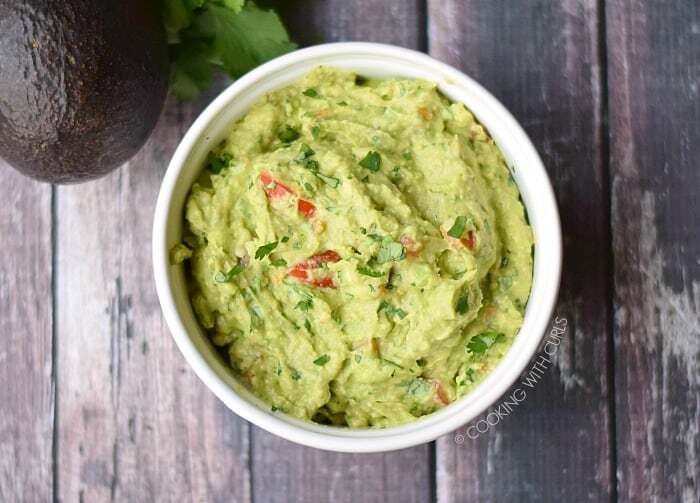 Creamy, tangy, and slightly spicy Guacamole is always a hit at any party, and it also perfect as a condiment on sandwiches! 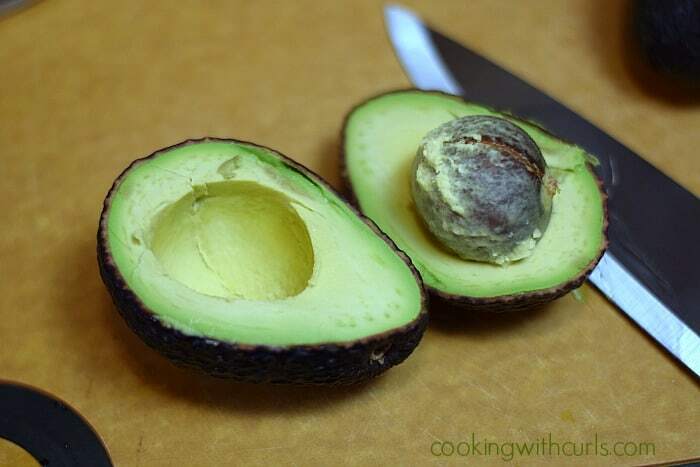 Cut, pit, and scoop out the flesh from the avocados. 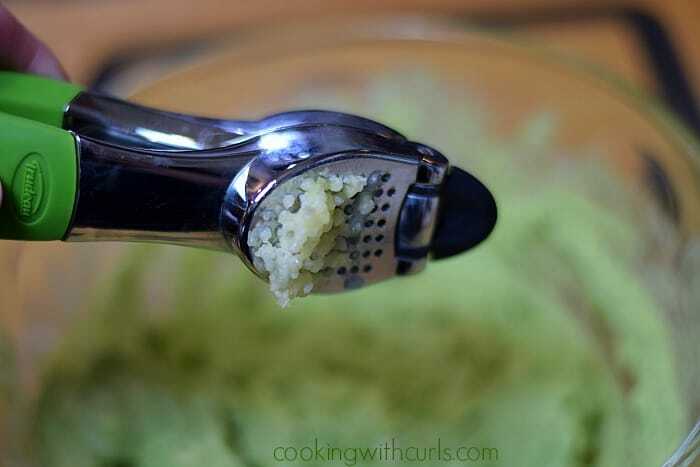 Place in a bowl and mash with a fork. Stir in lime juice, garlic, cilantro, green chilies, green onions, and tomato. Season to taste with salt and pepper. Spoon into a serving bowl and serve with tortilla chips. Substitute 1 jalapeno pepper for the canned chile. Substitute 1 Tablespoon diced red onions for the green onions. It would never last that long at my house! 🙂 Love guacamole and this sounds delish, Lisa! Lisa, this looks fabulous!!! Can you believe I (thought) I didn’t like guacamole until I went to Mexico and then I fell in love with it! 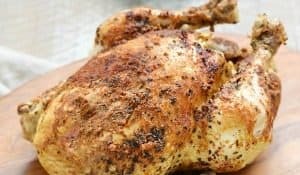 This looks so delicious – pinning! By the way, the new site looks awesome!!!! Thank you Cindy! Now we need to get working on yours. 🙂 I think I have worked out most of the kinks, and can figure it out!! 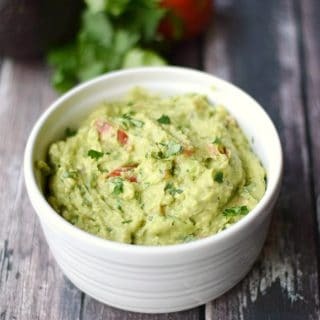 LOVE me some guacamole and need to make some again ASAP. Yum. Looks delicious and I love that you like it on a burger like me. So. Good. Pinned!! 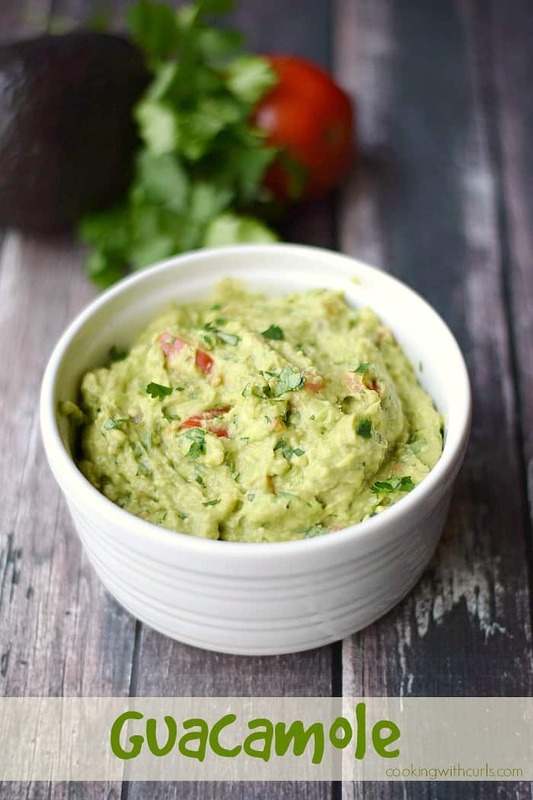 I’m with you – guacamole is the best! I can’t wait to see what you do with this as if it’s not delicious enough on its own. Yes, I love all things avocado. It feels like a guilty pleasure to me, because I think it is pretty high in calories? But I know it is all “good fat”… I gotta remember to buy a few when I’m at the grocery store next time. Now seriously, have you ever grown a plant of your own from the pit??? They are good fats Seana, so that is how I justify it in my mind. 🙂 No, I did not grow my own avocado plant, but my best friend did! The thing was huge after a few years. I think they may have planted it in the ground, but I will have to remember to ask her what happened to it!! Oh yes, I could put this guac on anything! 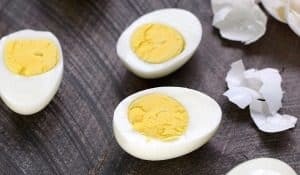 Loving this easy recipe, Lisa! 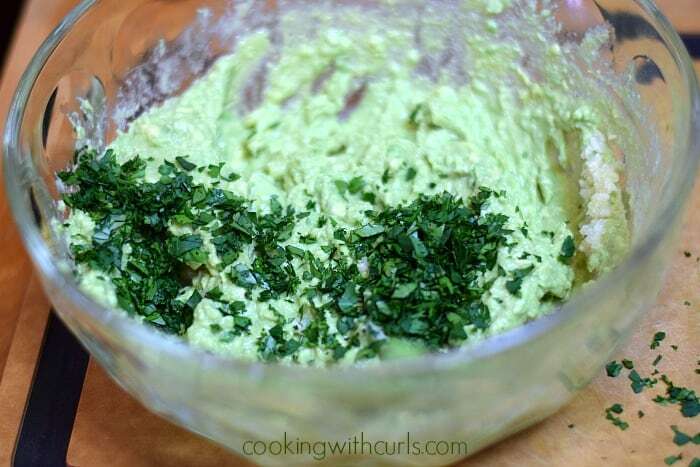 I never put chilies in my guacamole… need to try this recipe. 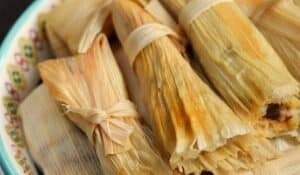 Pinned all your Mexican recipes… beautiful photos too. Thank you so much Diane 🙂 Sometimes I don’t add the chilies, it just depends on my mood!